However, Hamilton left Manziel on that list. And when his agent tried in September to force them to either sign him or let his rights lapse, the league stepped in (in a highly unusual move) to extend the negotiating window; that was because the CFL office hadn’t decided if Manziel was eligible to play there, particularly considering his past plea deal in a domestic violence case. Commissioner Randy Ambrosie eventually ruled later that month that Manziel couldn’t sign for that year, but could be eligible the next season if he followed a number of conditions, and Ambrosie eventually cleared Manziel (subject to further conditions) in December 2017. 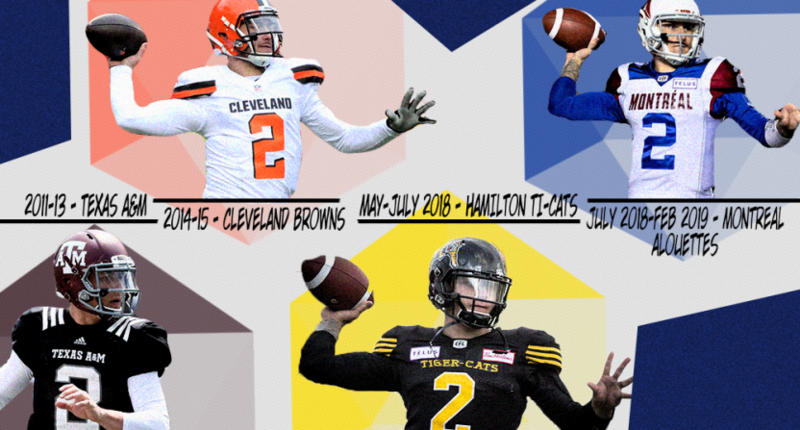 That led to Manziel signing with Hamilton that May (after a stint in the Spring League scouting event), impressing in limited preseason play, and eventually getting traded to quarterback-desperate Montreal in July after he couldn’t beat out CFL veteran Jeremiah Masoli atop the Tiger-Cats’ depth chart (for all head coach June Jones’ claims that Manziel belonged back in the NFL, he didn’t actually want to start Manziel). There, Manziel played in eight games, completing 106 out of 165 passes (64.2 percent) for 1,290 yards with five touchdowns and seven interceptions and rushing 29 times for 215 yards. And while he didn’t set the world on fire (he even lost his starting spot to Antonio Pipkin following his return from a concussion before getting it back later in the year), he did improve over the course of the year (four of those seven picks came in his debut), and looked to have a decent shot at starting again this season. Until this release. Exactly what Manziel did here isn’t clear, and it may never become public. When he signed last May, the league’s statement said “The league stated [in December] that it was prepared to approve a contract for Mr. Manziel for the 2018 season provided one was negotiated and he continued to meet a number of conditions set by the league. (While these conditions are confidential, out of respect for laws governing personal privacy, they are extensive and exacting. ),” and they mentioned that “subsequent inquiry confirmed Mr. Manziel has been meeting the league’s conditions.” Clearly, he wasn’t doing so any further, but it’s not obvious what conditions he broke. It’s interesting and unusual to see the CFL completely and formally ban a player. The first case where that happened was with Ray Rice back in 2014, with the league issuing a statement that no club could sign him in the wake of his release from the NFL following the release of video of his assault on his then-fiancée. But it’s unclear that any CFL club was actually going to sign Rice, and that move appeared to mostly be a smart preemptive ban. A more actually-impactful ban came in 2017, where Saskatchewan Roughriders’ DB Justin Cox was cut and then banned from the league in April following a third domestic violence arrest. (He was later found not guilty, but not let back in; he then wound up charged with assault again in August 2017, and pled guilty to those charges the following year.) And another Roughriders’ player, Jerome Messam, was released and then banned last summer after charges of voyeurism, while Ottawa Redblacks’ DB Teague Sherman was released and banned last July after sexual assault charges. But it’s extremely rare to see a ban, and in the Cox case, what he was accused of was widely reported. And while the league and the Alouettes may well be justified in parting ways with Manziel, and while they probably can’t announce exactly what he did for confidentiality reasons, the lack of detail here may leave some wondering if this is an overreaction or not. It’s worth pointing out that while the CFL does have a formal policy on violence against women, one brought in in 2015 after a long development process, that policy initially focused only on what happens while players are in the league, not what they had been accused of or charged with in the past. That’s meant that other players with pre-CFL accusations or charges of domestic violence have been able to play in the league. Now, this is years later and things have changed, and the conditions placed on Manziel weren’t necessarily just about his past domestic violence case, as there were other behavioral issues that came to light as well. But the league does appear to have been much stricter with Manziel than with other players with problematic pasts, and that raises some questions about if some of their focus on him was about his high-profile status. Maybe this release was totally deserved, and maybe the league has good information that Manziel was going to be a problem if he remained in the CFL. They also appear to be within their rights to do this; the CFL bylaws give its commissioner the authority to prevent any player from playing in the league, and while that power is seldom used (Rice and Cox appear to be the only previous cases), it doesn’t seem to be in dispute. And if Manziel did violate the conditions he agreed to, he likely won’t have much recourse to protest this. But it means his CFL career’s now ended before it really got rolling. And while there are now some other possibilities for him (like the AAF, or maybe the XFL next year), not just being released, but being banned from a whole league is certainly a red flag. We’ll see what’s next for Manziel, but this certainly seems like a major step back for him. Correction: this post didn’t initially include the Messam and Sherman bans.